Betconnect is an exciting new betting platform which works in a similar way to a traditional betting exchange, except with additional benefits for matched bettors. The idea for Betconnect was originally constructed to solve the issue of pro gamblers not being able to place bets at bookie prices as they were restricted for one reason or another. 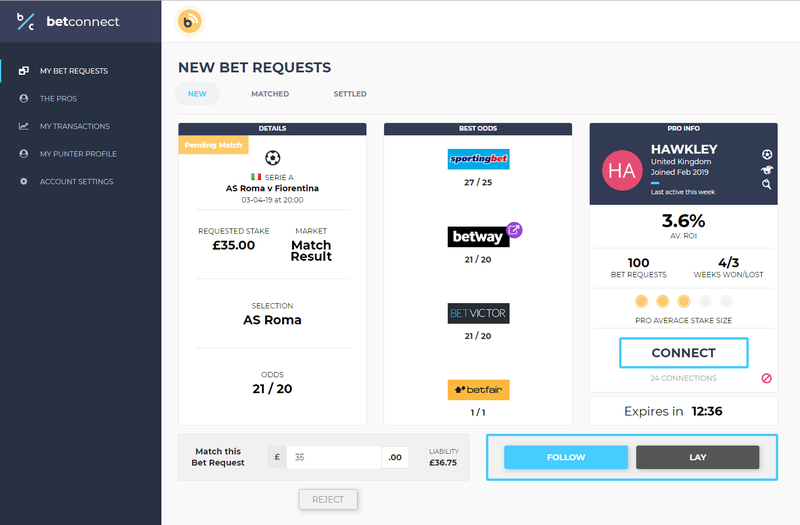 Betconnect solves that problem by allowing these pros to submit ‘bet requests’ which are then accepted by other users who effectively act as the bookie. Although Betconnect is a solution for restricted gamblers to place bets, it also provides an interesting way for matched bettors to generate more profit by reducing qualifying losses to zero and allowing more profit to be made from free bets. Join Betconnect today and get up to £50 in Free Matched Bets! There are two types of users at Betconnect, ‘Pros’ and ‘Punters’ and you’ll be asked which of these you are when you register. Pros – These users have been restricted from bookmakers and will use Betconnect to request bets. Punters – These users can accept the pros bets and act as the bookie. If the pros bet wins, the punter covers the liability and if it loses, the punter receives the value of the pros stake just like a bookie would. When using Betconnect for matched betting purposes, you’ll be acting as a punter so be sure to select this option when signing up. Once you’ve registered as a punter, you’re ready to receive your first Bet Request from a pro. You’ll be notified via email once one becomes available and you can simply log into your account to see what the bet is. Below is an example of a bet request. We can see above that a pro is wanting to place a £35 bet on Roma to beat Fiorentina at odds of 21/20. Betconnect displays the odds of bookmakers which have the best odds for that bet. As a punter, we can choose to accept this bet request and enter how much of the requested stake we would like to match. We’re acting as a bookmaker here so should we accept the bet request, our Betconnect balance will be debited the liability amount of the bet, which in this case is £36.75. This is the amount of profit that the pro would stand to receive should their bet win. We have two options when we decide we would like to accept the bet request. 1. Follow the bet – We accept the bet request and the liability is debited from our Betconnect account. We then head to a bookmaker and place this bet at the requested odds. Sometimes, higher odds will be available which means we can make a profit regardless of the result as we’ve effectively found an arb. The example above shows this with the requested odds being 21/20 (1.05) and Sportingbet offering odds of 27/25 (1.08). If you’re confident in the pros bet, you can place an additional stake as your own bet. 2. Lay the bet – If we think the pros bet won’t come in, we can simply accept the bet request but not match it at the bookie. If the bet loses, we’ll receive the value of the pros stake as profit. You’ll notice that the two options above sound like we’re either following or laying a tipster and that would be correct. That’s one way to use Betconnect. However, we’re matched bettors and aren’t interested in tipsters or punting bets. We look for real value and to lock in profits! So how do we use Betconnect to do that? Let’s take the example above where a ‘pro’ has requested a £35 bet on Roma to beat Fiorentina at odds of 21/20. We accept this bet and our Betconnect balance is debited £36.75. We then head to the bookmaker and place the same bet at equal or greater odds. If Roma win, we will lose £36.75 on Betconnect and win £36.75 with the bookmaker. If Roma don’t win, we will win £35 with Betconnect and lose £35 with the bookmaker. As you can see, we’re able to get perfect matches on bets every single time and what’s even better is that there are no commission charges. Betconnect only charge pros for requesting bets and not punters and so we’re able to cover all outcomes of a bet with zero qualifying losses. What this means is that as matched bettors, we’re able to participate in promotions such as 2 up, money back if 2nd, extra places, best odds guaranteed and more for no cost at all! We can also use Betconnect to extract more profit from our free bets as we are getting perfect matches with 0% commission. Let’s take a look at some examples of how we can use Betconnect to make a profit from bookmaker offers. Best odds guaranteed is offered by many top bookmakers. If you back a winning horse in an eligible race and the starting price of your horse is greater than the odds your took, you’ll get paid out at the higher odds. Here is an example of using Betconnect to profit from Best Odds Guaranteed. We accept the bet request and our Betconnect balance is debited £100 (the liability). We then place a £50 bet at Ladbrokes on Fast Sally to win at the same odds. Whether Fast Sally wins or not, we will break even. However, if Fast Sally wins and the starting price was greater than 2/1, we’ll trigger best odds guaranteed and make a profit. Let’s say that Fast Sally went off at odds of 3/1 (4.0). Fast Sally wins – We lose £100 at Betconnect but make £150 at Ladbrokes, giving us a total profit of £50. Fast Sally loses – We win £50 with Betconnect and lose £50 with Ladbrokes. We’ve broken even. As you can see, this is a risk-free chance of making a profit should Fast Sally win and the starting price is greater than the price we backed it at. Paddy Power’s 2 Up and Bet365’s Early Payout Offer are possibly the most popular bookmaker offers utilised by matched bettors. They don’t return a profit every time or even very often but when they do, the returns can be huge. The key to profiting from 2 up in the long term is to keep qualifying losses to a minimum. This is sometimes difficult depending on the odds on offer and by taking close matches, you run the risk of being gubbed at some point down the line. However, by using Betconnect for 2 up, our matches are always perfect at any odds and so we’re able to be in with the chance of making a profit whilst incurring no qualifying losses. We accept the bet request and our Betconnect balance is debited £300. We then place a £100 bet on Arsenal to win with Bet365 at the same odds. If Arsenal don’t go two goals up during the match, we will break even whatever the outcome. However, if they do go two goals ahead then Bet365 will settle our bet as a winner but we will also have our Betconnect bet running. As our bet with Betconnect is essentially a lay bet, we should be able to lock in a profit by simply placing an additional back bet with the bookmaker. Alternatively, if we let our bets run and Arsenal end up drawing or losing the match, we’d win both our Betconnect bet and our Bet365 bet, leaving us with £400 profit! Money back if 2nd is a common offer ran by many bookmakers. Sometimes, bookmakers may even offer money back if 2nd, 3rd or 4th on big events which provides an opportunity to make a profit should the horse we back finish in one of the refund places. Like most advantage play offers, the key is finding a good match to keep qualifying losses down. Again, by using Betconnect, we’re able to do just that to perfection, every time. We receive a £20 bet request for ‘Wonky Donkey’ to win the 15:10 at Wolverhampton at odds of 4/1 (5.0). We then place a £20 bet at 4/1 on Wonky Donkey with Boylesports who are offering ‘Money Back if 2nd’ on this race. Wonky Donkey wins – We lose £80 on Betconnect and win £80 on Boylesports. We break even. Wonky Donkey finishes 2nd – We win £20 on Betconnect, lose our £20 stake on Boylesports but receive a £20 refund, leaving us £20 up! Wonky Donkey finishes 3rd or later – We win £20 on Betconnect and lose our £20 stake on Boylesports. Again, we break even. Again, there is no possible outcome where we would lose money and if our horse finishes 2nd, we will make a profit. Finding close matches at higher odds for your free bets can sometimes be a pain and you may find yourself tempted to take a good match on an Argentinian 3rd division game due to lack of options which is never a good idea. By using Betconnect, we’re able to get perfect matches every time and usually on high-profile matches. Generally, we aim to extract 80% of the value of a free bet as cash. So, if we had a £20 free bet, we’d hope to get £16 cash from it through matched betting. In reality, we usually settle for somewhere between £15 – £16 a lot of the time. Let’s take a look at how much profit we can extract from a free bet by using Betconnect. 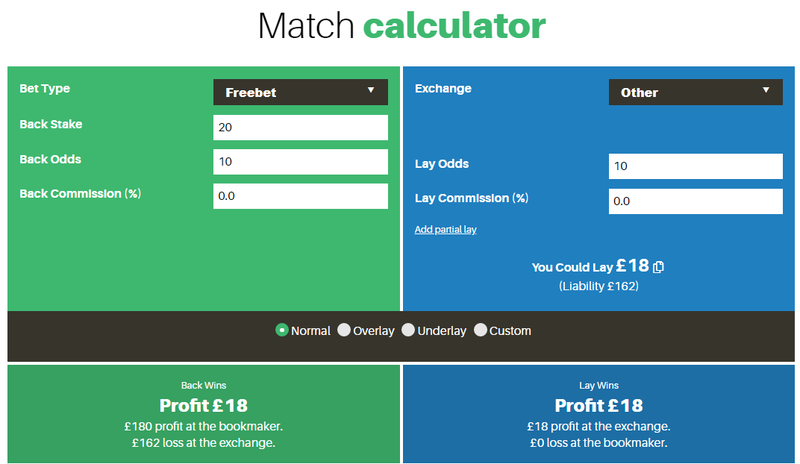 We have a £20 free bet to use with Coral and so we need to use a matched betting calculator to determine how much of the requested bet to match. We input the bet details as normal into the calculator, remembering to set the exchange commission as 0%. The calculator shows us that we need to lay £18 and so this is the amount of the requested bet that we should match. If Southampton win, we lose £162 on Betconnect but make £180 with Coral, giving us a total profit of £18. If Southampton don’t win, we win £18 with Betconnect and lose nothing with Coral as we were using our free bet. Again, our profit is £18. By using Betconnect for our free bets rather than a betting exchange, we’re able to extract roughly 20% more profit from our free bets. That’s impressive! If perfect matches aren’t enough for you, how about £50 free to give Betconnect a try? Sign up today, deposit a minimum of £10 and you’ll receive a £50 free matched bet! Your £50 bet credit can be used to match the first three bet requests you receive. Anything you win, is credited as cash and anything you lose will be covered by the bet credit up to £50. Simply opt-in to receive the free matched bet prior to deposit and it will be credited when you make a deposit of £10 or more. We’ve shown in this article how Betconnect can be used to generate more profit when matched betting. By using the platform instead of traditional betting exchanges such as Betfair Exchange, Smarkets, Matchbook or Betdaq, you’re able to get perfect matches every time with 0% commission resulting in zero qualifying losses and more profit. Betconnect can be a great tool for matched bettors and although it is a relatively new betting platform, launching in the Autumn of 2018, we’re expecting it to gain a lot of attention in the coming months. Sign up to Betconnect via the button below and give your matched betting profits a boost!